Peniche Surf Lodge is a brand new beachside property offering cheap luxury accommodation in Peniche,Owned and run by a family who love to surf ,travel and meet new people from all over the world ,here you will find Europes most consistant waves. We are situated a stone's throw from Portugal's spectacular Atlantic coast . Minutes from the 1st class wave spot Supertubos. At the foot of our garden is Papoa Beach, This has a semi reef, which is excellent for all levels of surfing, 200 meters down the road, the 3km Alfarroba dune beach that offers you waves the whole way along,to Baleal ,also brilliant for all levels of surfing. At the north end is Baleal with its own island over a causeway. Its about a 30 minute walk or just 5 minutes by car. Baleal offers some great reef breaks as well as calm beach breaks. It has many cafe bars overlooking the beach which makes it another perfect place to watch the sun go down. Peniche Surf Lodge is conveniently placed in Peniche town,which as well as consistant surf, offers fishing,snorkling,kitesurfing,golfing and boat trips and apart form stunning beaches, there are many restaurants, shops ,bars and nightclubs within easy walking distance. Not to mention only being a 15 minute walk to supertubos a first class surf spot. 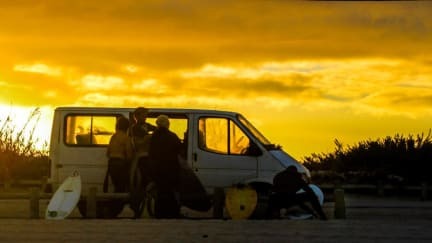 We can arrange equipment hire and lessons , also take you on surf surfaris up and down the coast,offer coaching,take photos and video footage to give analasys and edit a movie of your trip, also we provide airport transfers if needed. Back at the Lodge,we have Sky and cable TV a selection of Dvds ,wifi and nintendo wii ,for your entertainment. Daily rides to the beach and back. Free pick ups from peniche bus station.